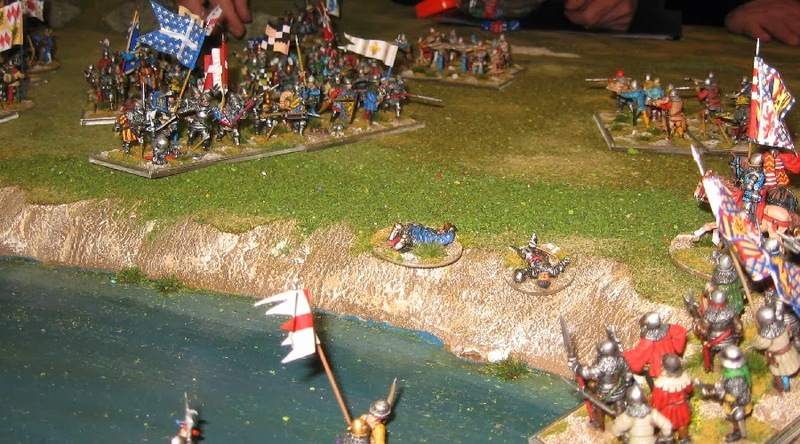 Three reasons: it worked fine for the recent Cravant game at York; it is an Italian wargame; no-one is currently taking it to the BattleDay. 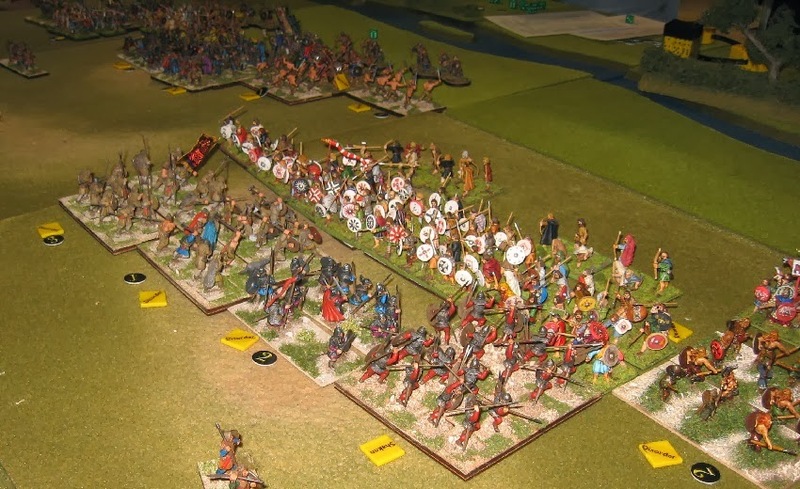 In order not to unbalance things wildly, I pretty much gave the players armies from the BI lists with minimal adjustment. 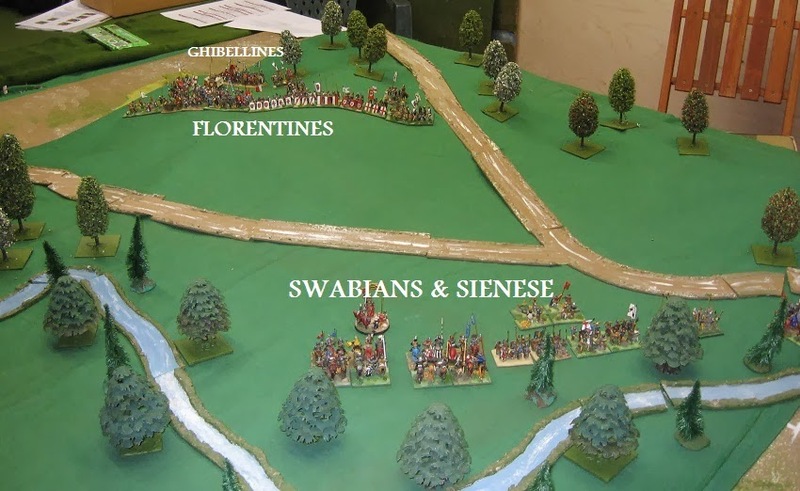 The Sienese are pro Imperial, or Ghibelline, the Florentines pro Papal, or Guelph. 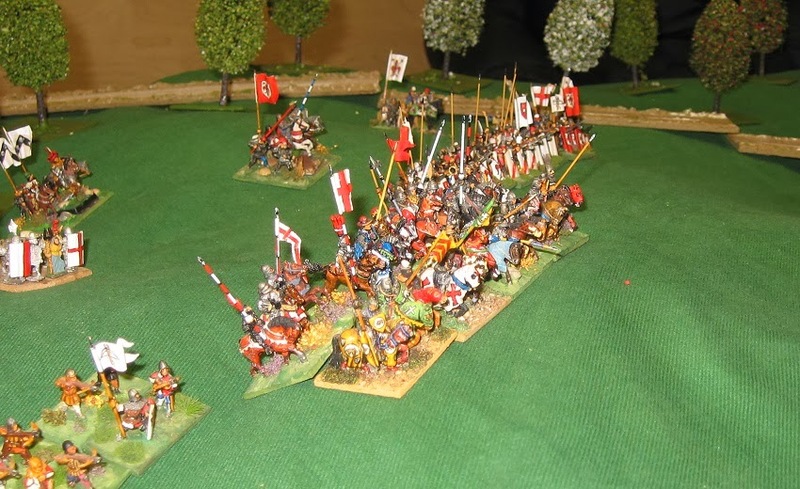 So the Sienese enjoy the support of a powerful Imperial cavalry contingent under Giordano Lancia ... the Florentines have the disadvantage that they have brought along a significant Ghibelline contingent (rather that than leave them back home in time of war) which they have parked at the back where they will do no harm. 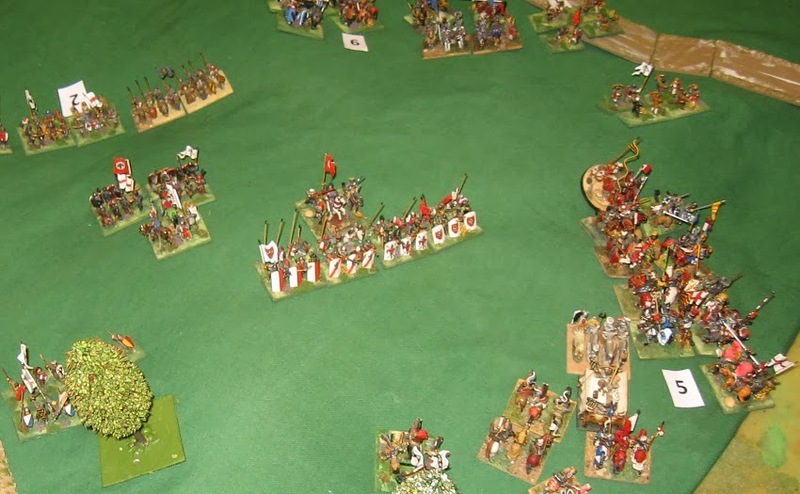 But the damage was done - the victorious unit had driven the enemy back towards their precious Carroccio, and, as a consequence, the Florentine player decided he had to order up the potentially unreliable Ghibellines. They defected. 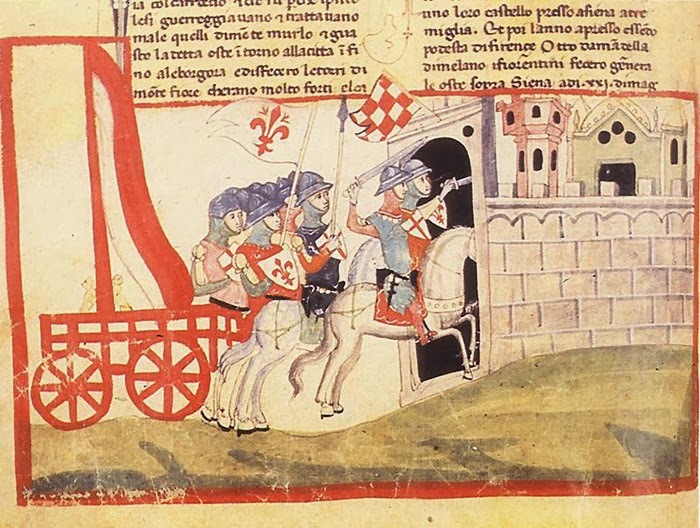 No such problems for the Sienese: they were relying on a surprise attack from beyond the edge of the battlefield - and it turned up mid battle. But the defection of the Ghibellines would be decisive - they were called upon to plug the gap and they did the opposite. Predictable, you might think - but I guess you don't make that call unless you are out of other options. 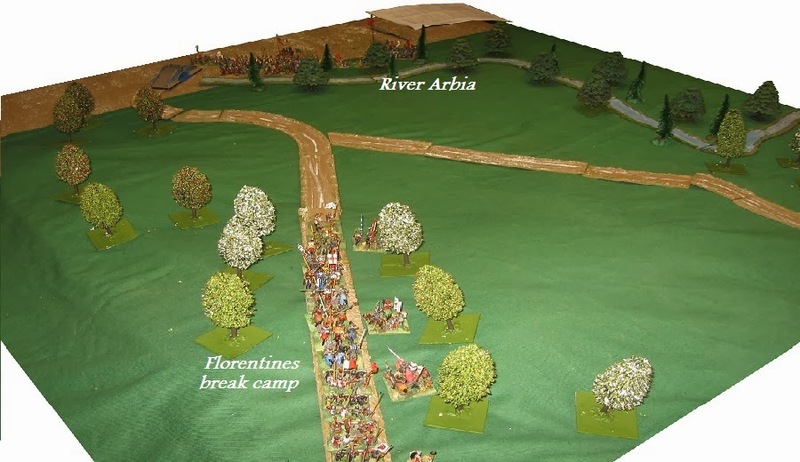 The battle turned into a scrappy affair around the Florentine Carroccio which the Florentines were never going to win ... 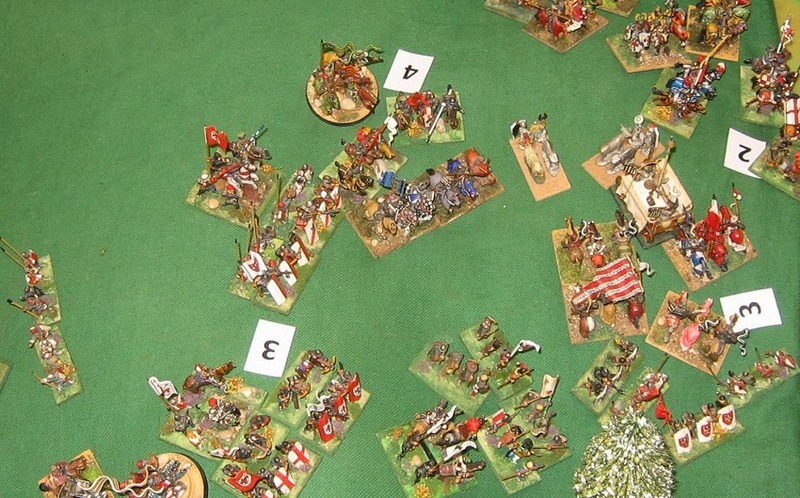 In the end, the Carroccio went down ending our game and, coincidentally, also taking the morale tally for the army to defeat (so had it been a 'pick up' game, it would also have ended at that point). 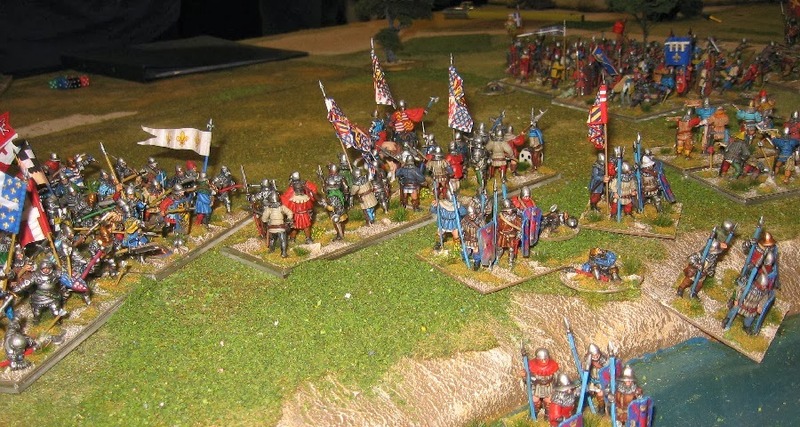 Following the original deployments and approaches, coupled with the Florentines failing reliability on cue with their Ghibellines, pretty much made the game run to script. *The VBU + Impetus bonus mechanism allows quite a lot of variation within a simple system. *Retreating from unsuccessful combat makes melees unpredictably mobile (unlike some similarly simple rules). *as the game was put on for beginners, I used numeric markers to help them keep tally of the units' declining VBUs. 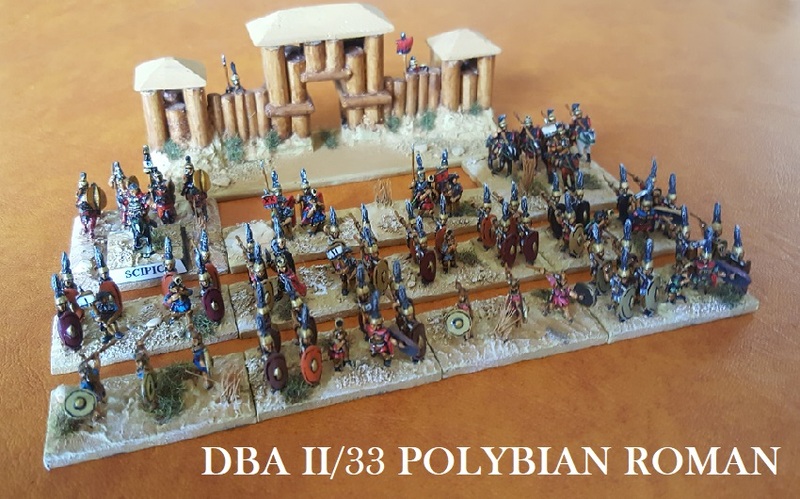 A more decorative way would be to add casualty markers, but I am not sure yet. Due to the treatment we have received over the years, SoA Shows North no longer supports Vapnartak. That usually means I would not go to the York Racecourse event. 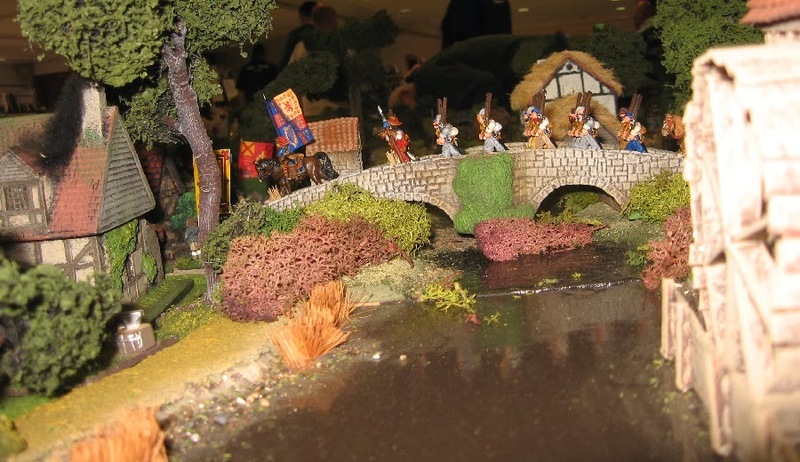 However, the weekend is also the occasion of one of our reunion gatherings and Steve had proposed a refight of the AWI battle at Brandywine Creek on the Saturday together with an invitation for players to play in the Lance & Longbow Society's Cravant demo game at the show. So, with two historical games on offer, Friday evening saw me heading North. 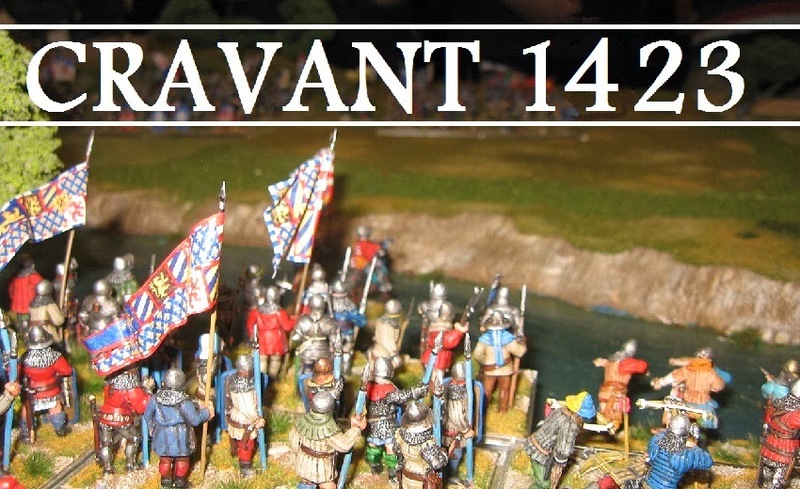 Last seen at Salute, Cravant is a visually splendid game, and intriguing as a scenario. It is set up for Impetus - which I still have not played that much - so I was keen to get some more mileage in. 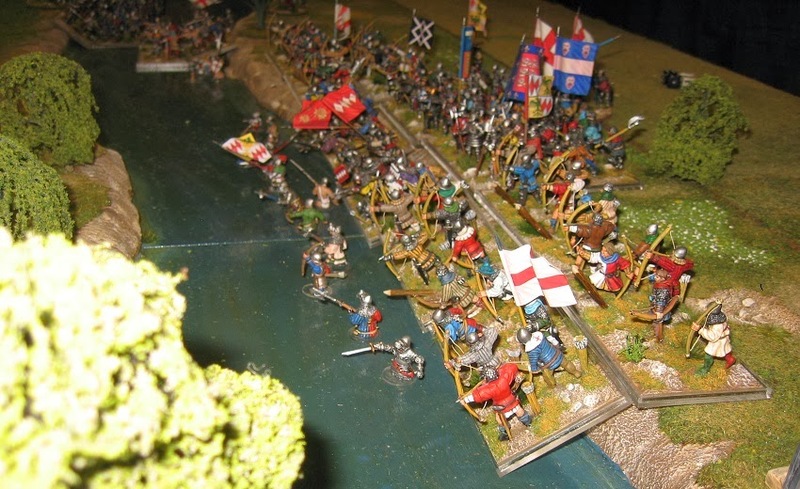 The battle is essentially an attempt by an Anglo Burgundian army to come to the aid of Cravant which had been besieged by the French in the opening moves of a new campaign in the Hundred Years War. Henry V had died, and England was in the hands of a minority ... so the Dauphin saw this as the time to break the agreed peace accords and renew hostilities. 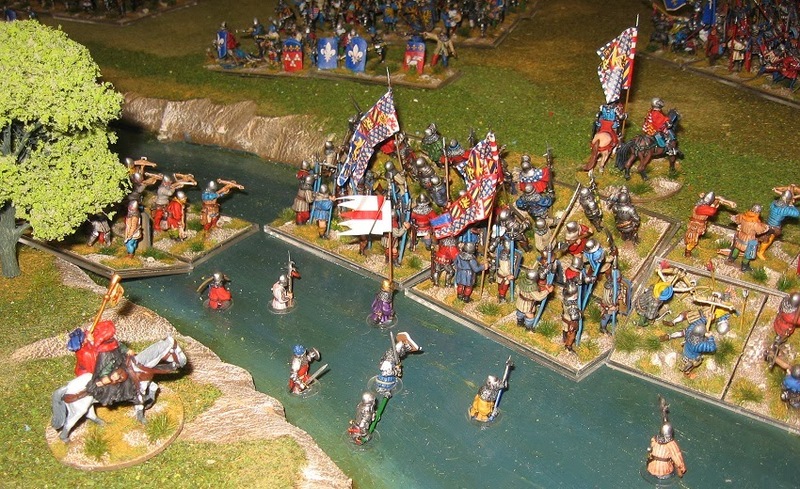 Salisbury led the Anglo-Burgundian force, and after a stand off across the river, ordered his troops to ford the Yonne. For the reconstruction, we had three players on each side ... a compromise between allowing show visitors access to what was going on and sufficient players to simulate the allied nature of both forces - I hope we got the balance right (I am not aware of turning my back on anyone but there is always a risk). I took the central, but weaker, Burgundian battle. We were first to get our feet wet. 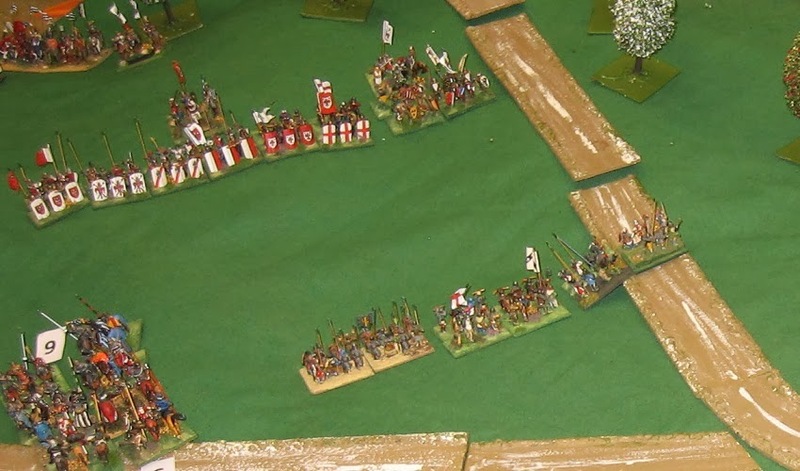 In the (modified) version of Basic Impetus in play, my crossbowmen were significantly less effective than the English archers on either side of me, and a rule was in effect allowing casualty effects to be 'passed back' further hampering my small contingent. 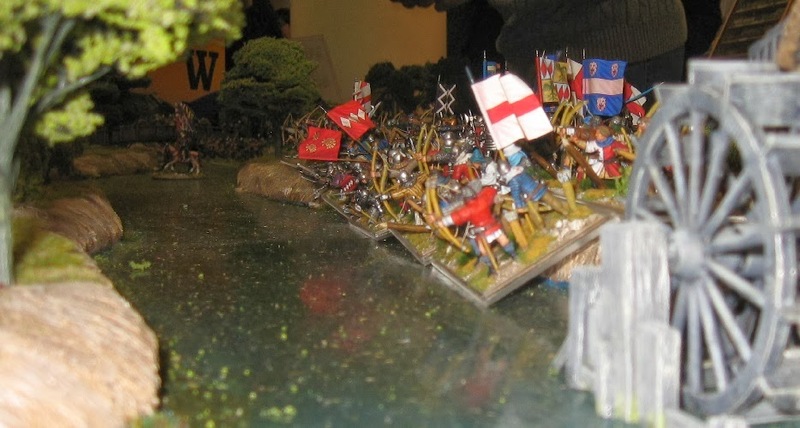 Whilst the English under Salisbury and Willoughby were smashing forward, I was losing the central slogging match ... driven back almost into the river. 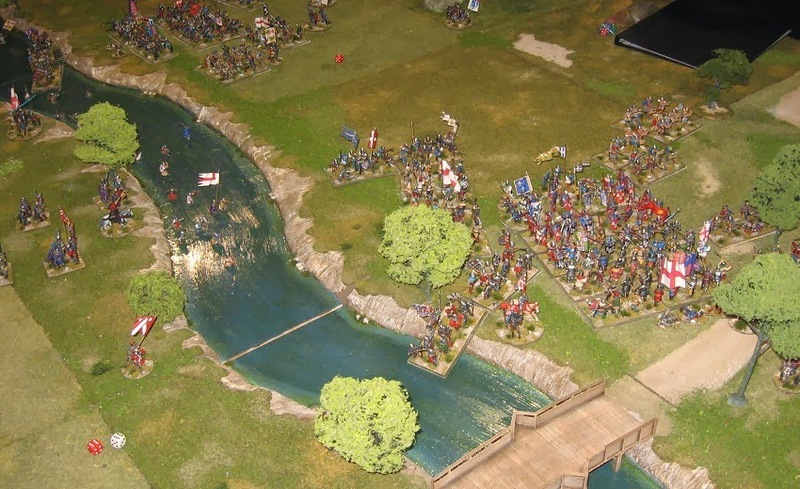 Meanwhile, Willoughby had pushed across the bridge and, supported by archers alternately wading and shooting, had secured a strong position between Cravant and the main battlefield. 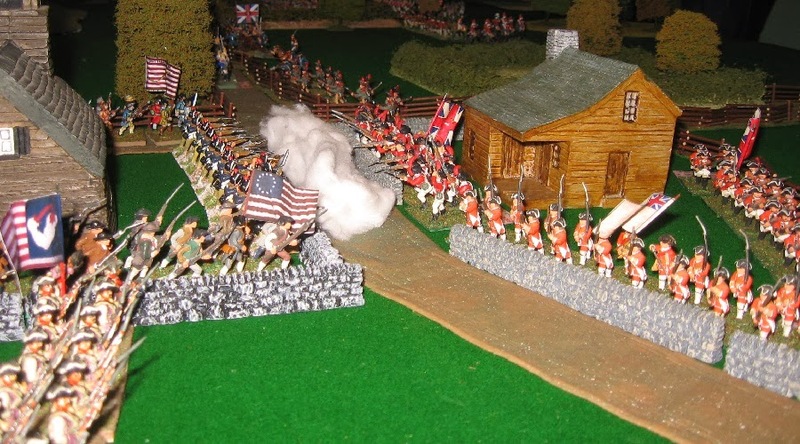 He too gradually ground the enemy down. 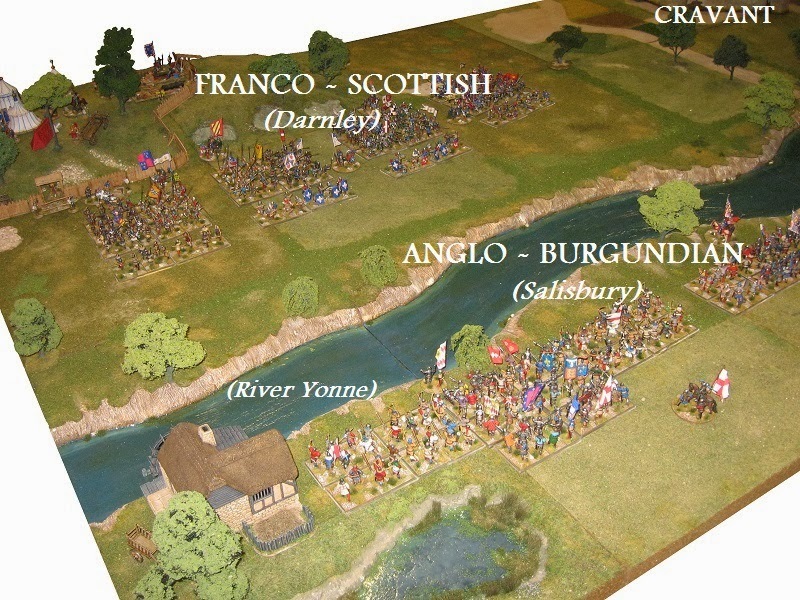 The major French successes in all this were mainly to the far flank, where they broke through the end of the line, pursuing across the river by the mill ... then turning back on Salisbury's rear. 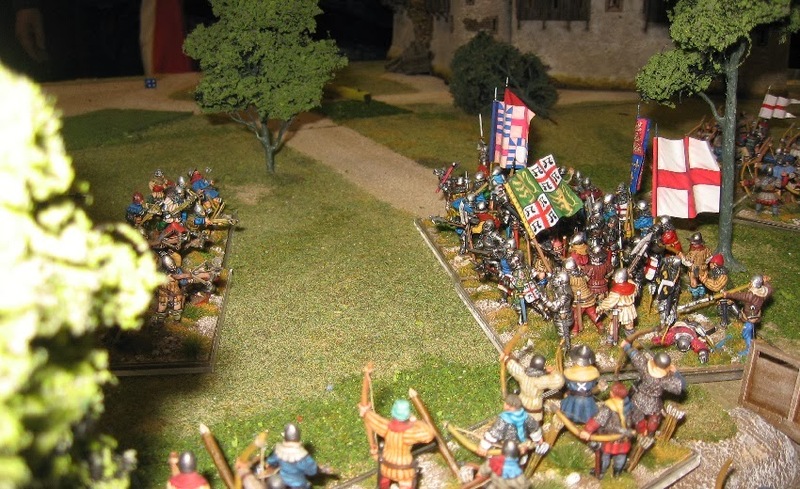 Had the English commander not destroyed the French to his front, this minor encirclement could have been devastating - however he was able to respond and stall the attack and the reverse was really too far from Cravant itself to affect the outcome of the battle. The battle was played to a conclusion, lasting about three hours, mostly before we took a break for lunch (OK, we probably needed a sign for 'resumes at 2pm'). 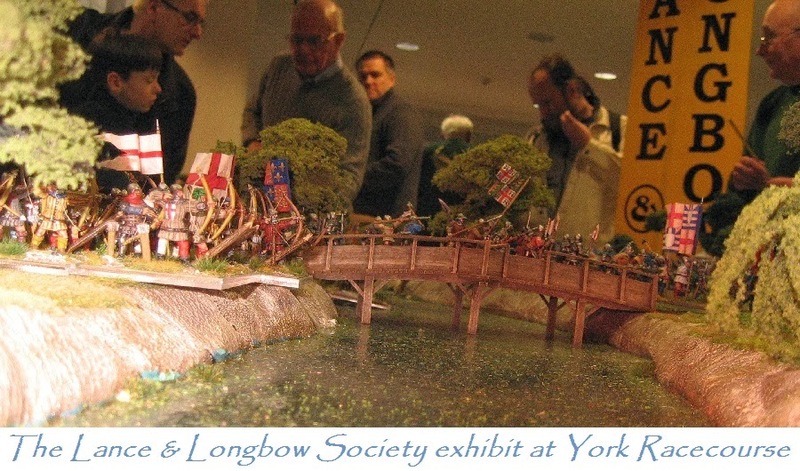 The York show doesn't change much and remains the same mix of big figure static games, fantasy pulp and shopping. I got some 15mm Vikings and Saxons, plus some little aeroplanes from Peter Pig, Donnington and Irregular, and some Landsknechts from Museum ... I took my camera with me when I went off duty. 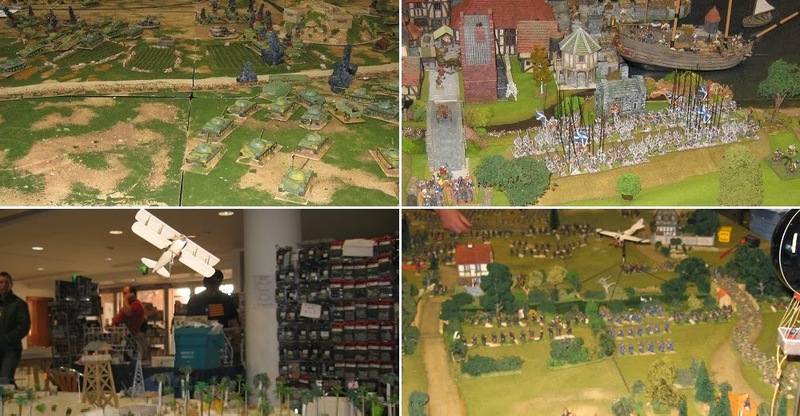 I didn't see the game being played at all, and but for the numbers, the figures were not outstanding - but maybe every show has room for one of these 'set design' battlefields ... Just one, though, hey, Vapnartak? York in February. And no snow. None at all. Thanks to the Gentlemen Pensioners for a splendid weekend and two sumptuous episodes from military history.